Crisp & Delicious brand Chicken Breast Nuggets have been recalled in Canada for possible Salmonella contamination. They were sold in British Columbia, Manitoba, Ontario, and Quebec, and may have been sold nationally. These products may be associated with human illnesses in Canada, according to the recall notice. 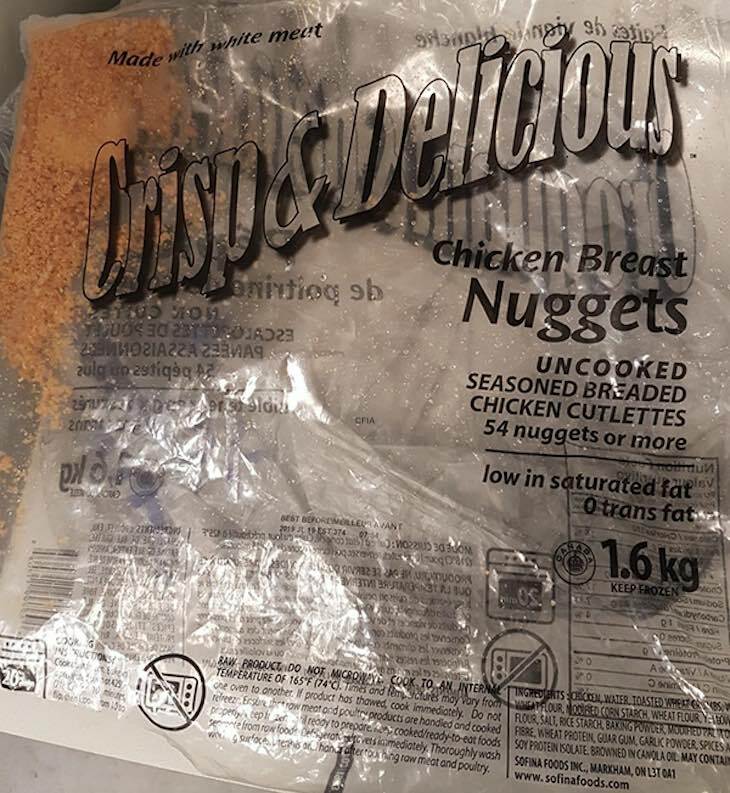 The recalled products is Crisp & Delicious Chicken Breast Nuggets – Uncooked Seasoned Breaded Chicken Cutlettes, in 1.6 kg packages. The code on the product is 2019 JL 19, and the UPC number is 0 69299 11703 5. Consumers are advised not to consume this product, and retailers are advised not to sell it. This product is mentioned in a Canada Public Health update on the Salmonella Enteritidis outbreak in that country that has sickened hundreds of people. This active investigation has found that 54 people living in 10 provinces have been sickened. The recall was triggered by the foodborne illness outbreak investigation. Officials are concerned that this product is in consumers’ home freezers. Please check your freezer carefully to see if you have this recalled product. If you do, throw it away in a sealed container, or take it back to the store where you purchased it for a refund. Do not cook and eat this product, even if you cook it to the internal temperature of 165°F. The symptoms of a Salmonella infection can vary from person to person. They may include headache, fever, vomiting, stomach and abdominal cramps, and diarrhea. These symptoms usually start within a few hours to a few days after eating foods that are contaminated with the pathogen. Long term complications include Reiter’s syndrome, which can cause reactive arthritis, endocarditis, and high blood pressure.